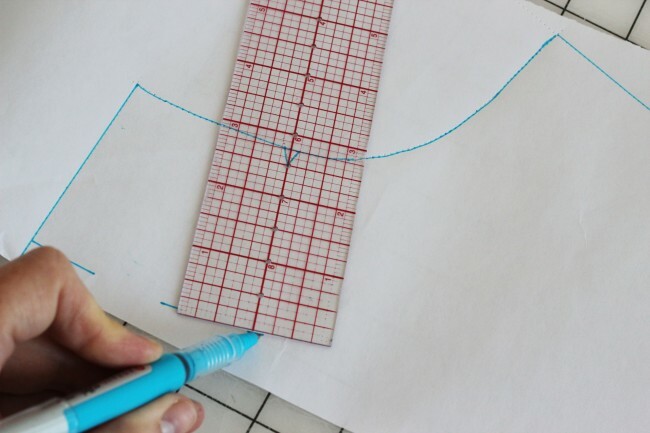 Have you ever used a pattern with a lining instead of a facing, and wished it had a facing instead? Or perhaps a pattern that called for binding an edge, but you think a facing would work just as well? It’s very easy to just draft your own facing pieces. 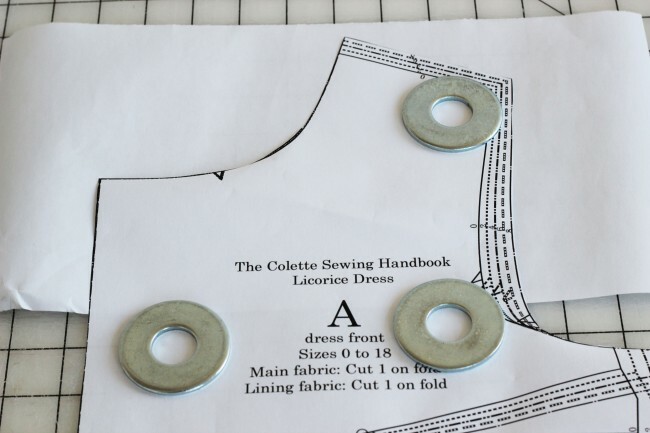 We’re going to show you how, using the Licorice dress from The Colette Sewing Handbook. 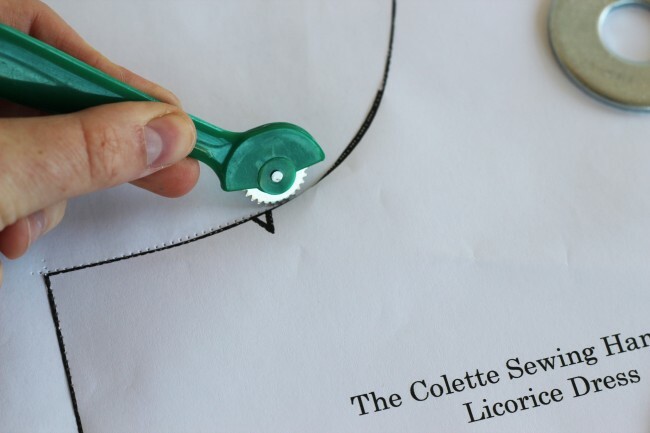 Licorice is fully lined to help it skim your body, but if you wanted to skip the lining, here’s what you need to do to finish the neckline with a facing instead. This technique will work on just about any pattern. 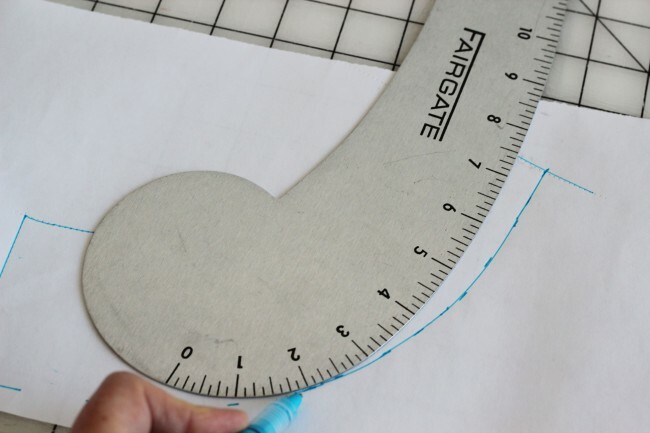 Lay the top of the front dress pattern on a large piece of scrap paper. Trace from the center front through the neckline, ending at the edge of the shoulder line. For this facing, I’m drawing a line 2 3/4″ from the neckline, for a nice wide facing piece. Mark the distance you want from the neckline, just be sure that it’s not wider than the shoulder line. Using a French curve, connect the dots in a nice curve. Cut out the piece and mark it accordingly. Repeat for the back dress piece. That’s it! Now just sew the facing like you would any other neckline facing, making sure to press and understitch the neckline seam. If you need a reminder, just refer to the instructions from another pattern with a facing, and you’ll be fine! Understitching: Use this handy tutorial to keep your facing from peeping out! 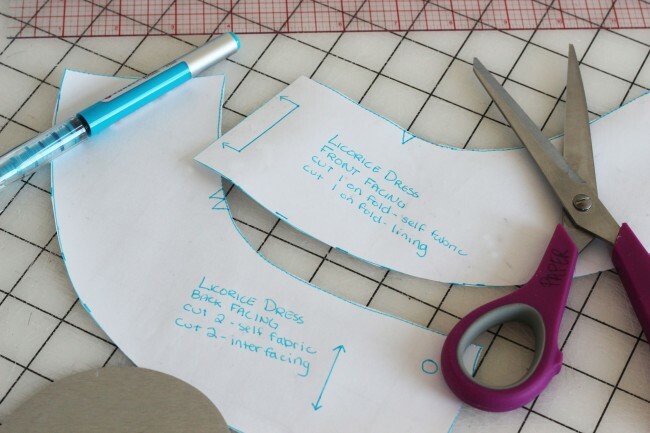 Zipper Tutorial: Sew an invisible zipper with a neckline facing. Staystitch: Strengthen your necklines with this simple method. I just learned how to do this in class! One thing I’d like to add is that for a facing not on the fold it should be drafted as the opposite of the pattern piece. I recommend tracing off the facing entirely with the tracing wheel and then flipping the paper over before marking the lines with the French curve. This way you are sure to cut out the facing so the right side of the facing faces toward you. I hope that makes sense. Thank you for always having awesome tutes and tips! So happy you posted this. One question: Do you think it’s best to interface the facing? I’ve seen this done on a lot of vintage dresses. I guess it probably depends on the fabric, but just wondering if this is a standard step. Mostly, yes. It does depend somewhat on your fabric, but most of the time neckline facings are interfaced to add some stiffness and stability. Thank you so much for this. I am horrible at putting linings in. This will be a great cheat until I get better at the whole lining thing. Thank you for being so generous with the information you share with us. I have learnt so much from your wonderful blog. I am eagerly awaiting Clover, Parfait & Jasmine – if only the postman would hurry up – it’s a long journey from Portland to Brisbane, Australia! How would you use this method to make an armhole facing? I love the way you have demonstrated making facings for the neckline. I have a pattern that suggests stretch material and I chose a non-stretch fabric, thereby forcing me to make facings for the neck. This information is WONDERFUL. Thanks tremendously. Just finished the Laurel dress. It’s so lovely. I made it in an indigo dyed cotton so it will fade beautifully over time. I messed up the finishing at the top of the invisible zipper and how it fits with the binding. The place where the hook and eyes belong is not smooth. I think that using a facing will give it a more finished look. Ideas about where I went wrong with the finishing at the neck? Thank you for the tutorial on neck facing.